The crash in oil prices continues to ruin your portfolio. U.S. stocks took another punch to the gut on Thursday as investors freaked out over oil diving back below $27 a barrel. After a day of wild trading swings, the S&P 500 lost another 1.2%. The index, which represents 500 of the largest U.S. public companies, closed at its lowest level since April 2014. The Dow ended the day down 255 points after falling as much as 412 points. The index has now lost an incredible 1,765 points this year. The Nasdaq fared better, sinking 0.4%. However, the tech-heavy index is still flirting with its first bear market since the Great Recession. "There's a broad-based lack of confidence," said Anthony Valeri, investment strategist at LPL Financial. "Everything suggests this market is heading lower in the short term. Psychology is too frail." Global market are also in turmoil. 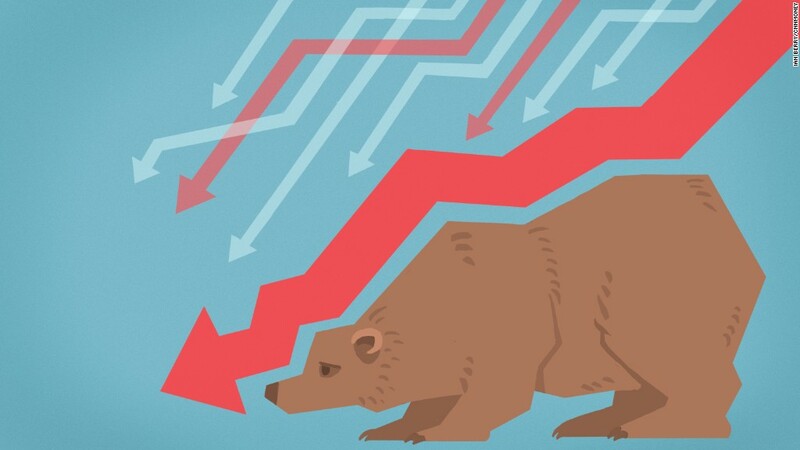 A global stock market benchmark known as the MSCI all-country equity index officially fell into a bear market on Thursday. It's now down more than 20% from its record high in May. The latest market mayhem reflects how anxious investors remain over the slowdown in global growth and the health of large European banks. But the main focus continues to be oil, which plummeted 6% to as low as $26.05 a barrel on Thursday. That's the weakest price since May 2003. Oil prices recovered a little and went back above $27 a barrel after Dow Jones reported an official from the United Arab Emirates said OPEC is "ready to cooperate" on output cuts. However, it's not clear the UAE official was signaling a policy shift. He also noted non-OPEC producers are already cutting back due to the decline in prices. The intense focus on crude shows that while cheap oil is great for consumers, it's fueling lots of turmoil on Wall Street. Investors fear it's a bad omen, signaling something wrong with the underlying economy. That's despite the fact that many believe the oil crash has been driven by an epic supply glut, not an alarming decline in demand. The oil collapse is also causing trouble for energy companies, with dozens filing for bankruptcy over the past year and many others slashing jobs. "People are losing jobs in the oil patch. Will it create a domino effect to other parts of the economy? That's the fear," said Valeri. Fears are also on the rise about the big banks that loaned money to energy companies and expectations that rates will fall even lower. Central bankers in Japan, Europe and Sweden have already embraced negative rates and Federal Reserve chief Janet Yellen said the U.S. is "taking a look" at negative interest rates, though she didn't indicate such a move was likely anytime soon. European banks have been plunging in recent weeks. Shares of Societe Generale (SCGLF), one of France's largest banks, tumbled 13% on Thursday after reporting poor results. Other big banks like Credit Suisse (CS) and Deutsche Bank (DB) also fell sharply. "European banks are suffering from a crisis of confidence," Michael Block, chief strategist at Rhino Trading Partners, wrote in a client note. U.S. banks also got crushed again, led by a 7% drops for Bank of America (BAC) and Citigroup (C). The S&P 500's financial sector is the worst performing group this year, down 17%. PIMCO warned in a report on Thursday that negative rates may be having a "chilling effect" on financial markets and carry "unknown consequences." No matter the cause, signs of fear abound in financial markets. Gold, which tends to rise when people are scared, surged 4.4% to a one-year high of $1,247.80 an ounce. It was the biggest buying binge since 2013 for gold, which is now up 19% since mid-December. Investors are also fleeing to the safety of government bonds. The 10-year Treasury yield plummeted to 1.53% on Thursday, its lowest level since August 2012, before rebounding sharply to 1.64% by the end of the day.